In Atlas Shrugged, Ayn Rand repeatedly alludes to the supposed nature of Altruism, a characteristic she believed to be destructive and counter to man’s nature. In a novel based around man’s ego and self interest, Ayn Rand depicts Altruism as the evil that created the dystopian scenario that Dagny Taggert and Hank Reardon found themselves fighting to stop. You will often find the various antagonists from Atlas Shrugged claimed the need for sacrifice for the good of the whole/majority. This ‘need’ of self sacrifice often ends with decisions that cost the jobs, livelihood, and the actual lives of civilians caught in their grand schemes. Eventually, this fetishization of the idea of self sacrifice leads to the destruction of much of the United States and the world, economically and socially. Ayn Rand has this scenario play over and over again until she paints the picture a dozen times over: Altruism is very very bad. It is what made Atlas Shrugged what it was, a gargantuan novel about the results of socialist and pluralist governments, as well as the danger of the masses. 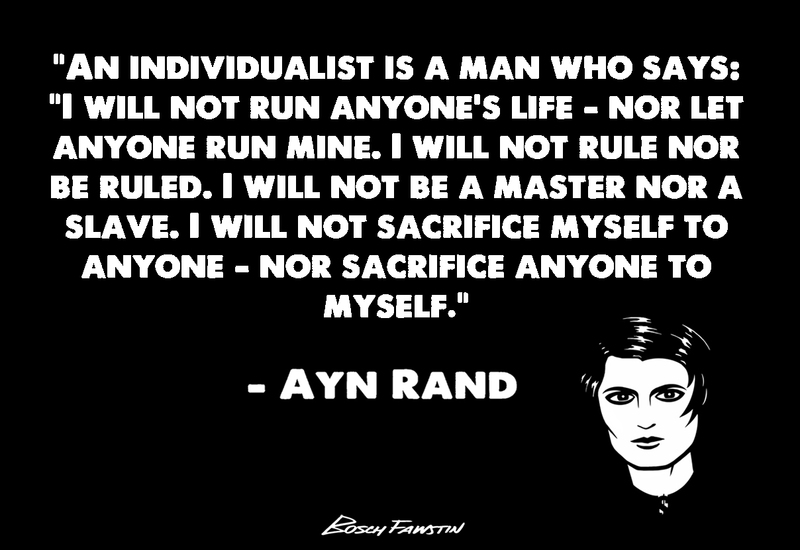 All of those things are made possible, at least according to Rand, because of this idea of “Altruism” and the idea that the individual must sacrifice for others, regardless of the consequences to the self. Before we move on, keep in mind that Ayn Rand did leave the door open to the idea of intentionally starving your child being okay ethically-even if it happens because you preferred buying a hat over food. 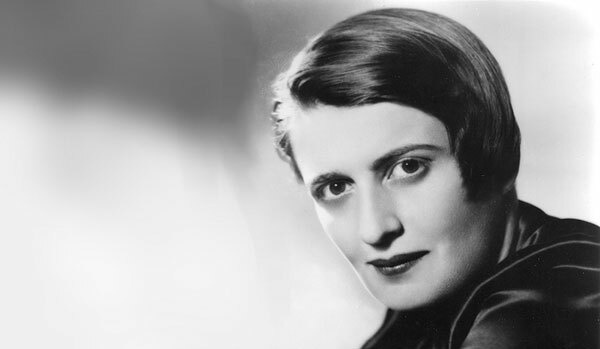 What Did Ayn Rand Mean? To Ayn Rand, charity, kindness, and recognizing the existence of others by helping them is not Altruism (We’ll get to that in a moment). What is Wrong with Sacrifice? Ayn Rand believed that individuals act out of self interest, and that contrary to popular belief, this wasn’t a bad thing. Alluding to the first quote, she believed that whenever you do something willingly for someone else, you most likely do it because you want the product of exchange. For the mother, the well being of her child was the product, thus she chose food over a hat. Again, a Sacrifice was “self-immolation”, something done not out of self interest, but because you are either forced to or because you actually believe self-denial to be good. In other words, outside of you being forced into jail for trying to kill an innocent bystander(or a similar situation), ‘sacrificing’ was wrong. Our system of morality originates with the idea of self preservation. Planting plants to harvest leads to food which we can eat to survive, therefore it is good. This eventually got more and more complex to the system of ethics before us now. This is what made Rand believe that Self Interest was an innate good, rather than bad. Through this, she also hits at arbitrary ethics and morality set by both religious and secular philosophers(“Moral Instinct”), and argues that ethics can’t be based on anything but our own objective experience. This is where Rand’s philosophy actually gets quite interesting, because it all begins to come together. You might say that by legitimizing any actions done out of self interest, you now allow massive amounts of abuse, corruption, and violence. However, this would be negating Rand’s view on Altruism. By forcing or manipulating someone else, you take away their ability to act out of self interest. In other words, you make them a sacrifice. This denies whoever is forced/manipulated of their ‘agency’, their ability to act and choose for themselves. You make it impossible for someone to act out of self interest when you murder them, and this continues on into areas such as stealing, lying, etc. When you stifle a person’s right to live as they want, assuming they aren’t harming others, you make them sacrifice their lifestyle, time, money, etc. So when operating under the ethical construct Rand creates, we see things such as ‘Natural Rights’ are still very much preserved. The reality is that greed will always exist due to Human nature(we are biological beings who need to survive); however, contrary to the claims of others, Rand also says that it is greed and self interest that will actually lead to progress. I do and don’t agree with this, and that depends entirely on the context. I agree with Rand that you should not be forced into giving to any cause without mutual consent. Coming to mind are my bailout and national security examples. That extends to charity, something that I believe should be completely voluntary as well. However, I believe there are moral imperatives that should be met, and that it is a good thing to give to those in need, etc. This is a discussion for some other time, though. 1. First of all, Rand views child care/charity as an exchange. With a child, not only do you want to protect your progeny, you project what you think is of worth into the world by instilling it into your kid. You feel good when you help the poor, just like you project your view on how the poor should act/pursue life when you give them work, etc. You shape the world to your desire. I see nothing wrong with this, and I find it rather undeniable. 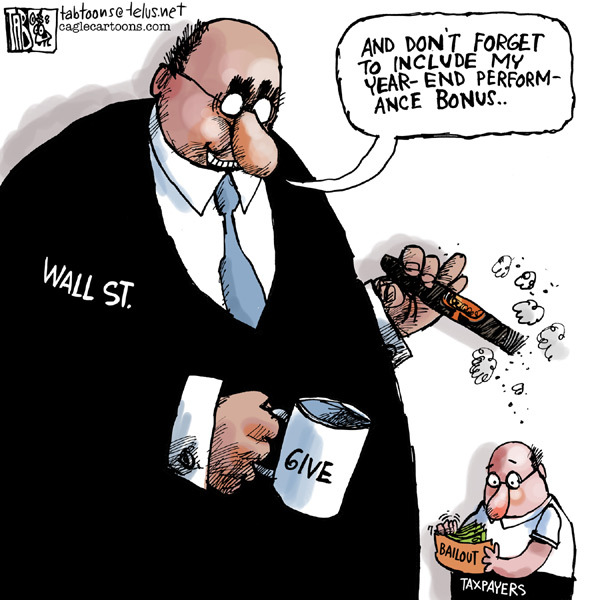 You get something out of every exchange, else you wouldn’t be doing it in the first place. 2. Second, by attempting to split the self interest from our actions/decisions, we either lead to our own demise(giving everything you have till you die), or we use it as a tool to manipulate/harm others. Far too often we hear “for the common good” used to justify atrocities or the outright theft of peoples’ money by groups and politicians. The idea of altruism leads to the justification of Sacrifices, whatever that may be. To me, not only is she wrong on point three(I believe there is virtue in such acts), but she also contradicts herself. How is an act self sacrificial when you personally want/gain from the act? What if it was your child? Some sort of war/revolution of liberation or defense? If you value those things above your life by seeing the value from the future of your ‘investment’, are you not facilitating a trade? So long as you are not viewing yourself, the individual, as unworthy/evil, but just in fact believe that your death/sacrifice will serve a greater cause that also serves your interest, how are you doing anything wrong? To me, there is a major gap here that can be filled with numerous situations where the actor is indeed being ‘selfish,’ and is not just sacrificing themselves. Altogether, with these three components combined, Rand’s argument against Altruism holds some warrant. To me, it really applies to the “Intentions vs. Reality” facet of life. As humans, we often have very good intentions that back our actions, but more often than not, those actions create a situation worse than before. In society, we belittle any kind of greed or ambition, but if it wasn’t for these exact type of emotions and the individuals who have them, where would be we? I’ll leave you to decide. As usual, Rand was onto some ideas that have both valuable and questionable thinking behind them. Luckily, she didn’t force anyone to accept them, but instead wrote and spoke extensively to convince us. This entry was posted in Authors, Ayn Rand, Literature, Objectivism, Philosophy, Politics and tagged Altruism, Atlas Shrugged, Ayn Rand, books, business, Charity, corporations, corruption, homeless, Life, Literature, Money, Movements, Objectivism, Philosophy, poverty, reading, Selfishness, values, work. Bookmark the permalink. You’ve done a much better job than most at understanding Rand’s uncommon system of morality. Kudos! I think this is likely because of your approaching the subject with the aim of actually understanding what she means, rather than the aim of dismissing her regardless of what she means (which too often is the case with her critics). So, double kudos for your objectivity in approaching a controversial issue! While I can’t speak for her, I do not think that Rand was leaving open the idea of a mother buying a hat rather than feeding her child as a moral option. Re-read the whole quote that you posted. It begins with “do not call your *best* actions a “sacrifice”….” Then the “best actions” which she describes are 1) A mother valuing her child more than a hat, 2) A man valuing his freedom more than living in slavery, and 3) A man valuing his convictions more than some monetary sum. The alternatives in each scenario are seen and contemptible by Rand (and meant to be read that way in the quote): valuing a hat more than your own child, not valuing your own freedom, and not valuing your own convictions — or not having any to begin with. The key aspect of Rand’s morality which many seem to miss is that she was an advocate of one’s own RATIONAL self-interest — which means that morality does not simply consist of following your values, whatever they may be. Rather, morality consists in properly identifying that which is objectively valuable, sorting your own subjective values in a hierarchy accordingly, and then acting in sync. I don’t know that she ever explicitly spelled it out in that way (and there are some philosophical issues in her metaphysics and epistemology which may have prevented her from explicitly saying it like that), but I believe that, at her best, that is what she meant. At the very least, that is what I mean in my morality, and what I take her to mean in the morality she sets forth in her novels. The upshot is that morality is inextricably linked to reality such that the aim of morality is aligning one’s self subjectively up with the way the objective world is. I think this is also perfectly in sync with the Biblical view of morality where the moral comes from the internal (that which is being valued) rather than the external (the mere action), and where there are objectively right and wrong things to value, based in what is objectively true and false about reality. In sum: irrationality is sin, and sin is irrationality. The unique aspect of Rand (unique to our time and culture — not unique to the Bible necessarily) is the realization that altruism is irrational (and therefore sin); that the ego (the self) is an essential aspect of morality, and any attempt to deny, destroy, or evade the self will necessarily result in the denial, destruction, or evasion of true morality in general. This, the appreciation of the self as essential to morality, is something which the Kantian, altruism-peddling, anti-intellectual, modern Church desperately needs to be reminded about. That is why I have begun the campaign of Christian Egoism. I think that you are not truly an egoist if you believe this to be true. Egoism is based upon acting in one’s own self interest. So in the case of the woman and the child, it WOULD be moral for the woman to buy the hat if she did value the hat more than the child, and this is where I think egoism as a moral system falls apart. It is based entirely upon one’s own subjective values. In order to justify it, you have to undergo some serious mental gymnastics. Sure, in most situations the woman would value her child more than the hat, however that simply avoids the question of WHAT IF the hat was more valuable to the woman than the child. What if the woman made her judgement based upon greed and disconnected her own personal satisfaction from the satisfaction of others. Then, under the moral system of egoism, it would be moral for the woman to let her child starve as she gained more pleasure from the hat. The only way to counter this, and I believe you attempt to get at this in your post, is to assign certain value based on reason to these objects and say that the woman was wrong in her judgement on the value of the child. This line of reasoning has its own problems. Objectively valuable. I am not going to let you get away with making this statement without providing warrants as to whether it even exists. Remember, if the value we place upon the child and the hat is subjective, we see an immoral act justified ergo proving that egoism is a flawed system. Even the statement that value can be derived rationally opens a huge point of argumentation that your post simply doesn’t do enough to resolve. Even assuming that we can objectively find value, this still doesn’t solve our problem. The step after the objective is to, as you put it, “sort your own subjective values in a hierarchy accordingly.” I don’t understand the point of obtaining objective truth about morality if your end goal is to muddle that objectivity with subjectivity. This act of sorting our own subjective values justifies the decision to value the hat. Subjectively, the woman could value the hat more than the child based on her objective framework already created. As long as you allow even an ounce of subjectivity you will see immoral conclusions justified by egoism as “moral.” This faulty episteme leads to faulty conclusions and does not mesh well at all with your version of egoism. You attempt to get around the problem of subjectively choosing false by creating objective criteria. Even if we assume your methodology is sound, you create some problems of your own. You create a system in which a man with good intentions acting based on available knowledge is immoral if he conducts an act opposed to an unbeknownst objective law. For instance, a man decides to kill a spider in order to save a fly struggling in said spider’s web, which he values more than the spider based upon his own prior reasoning. However he violates the law his reasoning was unable to come to, universal law # 5. Thou shalt never slay a spider as long as thou shall draw breath. This makes this man’s actions immoral. Denying human intention as a vital part of morality seriously overestimates the ability of people to come to objective truth. I have tried to construct and refute the most coherent argument possible against your post, but honestly I think that on face value you are seriously contradicting yourself. “The upshot is that morality is inextricably linked to reality such that the aim of morality is aligning one’s self subjectively up with the way the objective world is.” I don’t know how you claim to be able to line your values up with objectivity if your values are then subjective. As I’ve already established, unless you can prove absolute objectivity, then letting the boy die is acceptable. You don’t claim this, but kind of do, but kind of not. I don’t completely understand so I tried to make my post respond to as many of these viewpoints as possible. If my post seems muddled that’s probably why. SO- in conclusion, egoism is wrong because you kill children. And that’s bad. 1) The possibility of objective value — or knowing objective value. 2) The ideal of aligning one’s own subjective values with that which is objectively valuable. 3) Referring to that as ‘egoism’. 1) The possibility of objective value & the ability to know it. You say “You create a system in which a man with good intentions acting based on available knowledge is immoral if he conducts an act opposed to an unbeknownst objective law.” Yes, that is true. Many of the worst human atrocities have come from “good intentions”. Those good intentions do not negate the hundreds or thousands of deaths which they caused. You also say “Denying human intention as a vital part of morality seriously overestimates the ability of people to come to objective truth.” But I do not deny human intention — I simply do not hold it as the standard of morality. Of course, a man who intends the evil he commits is worse than a man who does not intend the evil he commits, but unintentional evil is still evil. I do not ‘overestimate’ the ability of people to come to objective truth; I simply recognize that reality does not take our ability into account: a man who is unable to discover the proper means of survival will not be permitted by reality to survive — regardless of how much he ‘wanted’ to. A is A — irrespective of any human intention to figure it out. This does not “deny human intention”, but it does remove “human intention” as an excuse for those who do not take truth discovery as a life or death issue. And don’t go belittling this topic by discussing the trivialities of smashing a bug. You, I, and every one who reads this, knows that there are much bigger, and more obvious moral issue to be addressed. I do not deny that human intention plays a major role in morality, but reality trumps human intention every time — and often reveals the true human intention which the human(s) often attempts to evade. The truth is that generally, those who want the truth bad enough will discover it — and those who don’t care will reap the consequences. The biggest and most important truths are those which are the most obvious to the one who genuinely wants to discover them — and simultaneously the most difficult to understand for those who desperately want to evade them. 2) The ideal of aligning one’s own subjective value with that which is objectively valuable. The objection here seems to be the fear of allowing subjectivity into morality, but it is a misguided (or misinformed) fear. Subjective morality (the thing you seem to fear, here) is the practice of determining what is ‘objectively moral’ based on one’s own subjective whims. I agree with you about the dangers of such thinking. But that is exactly the *opposite* of what I am saying. I prescribe aligning one’s own subjective values up with that which is objectively valuable (the exact opposite of subjective morality). Perhaps you think that the subject ought to be left out of morality entirely — but that is impossible. The subject is simply the human actor; a person with a mind, values and will. Apart from the actor (the subject), there is no morality to speak of. Perhaps you just want to leave the subject’s values out of it, but that is also impossible — and irrational. No man can act apart from his values, and the attempt to act against one’s values is the attempt to split one’s soul and to fake reality (to be a hypocrite). Therefore, the only possible format for objective morality is the one I prescribe: the alignment of one’s own subjective values (the mind and will being implied) with that which is objectively valuable. You seem to assume that ‘egoism’ must necessarily mean “pursuing one’s own subjective interests, with no heed to objective morality”, but why force the subjective understanding of the term? ‘Egoism’ simply means “self-interest”. Why not use it to mean objective self-interest, rather than subjective self-interest? Is subjective self-interest really even self-interest!? If a man subjectively chases his whims without regard to what is objectively true, right, and good, won’t he end up destroying his self? And isn’t self-destruction the antithesis of self-interest? Then subjective “self-interest” (egoism) cannot truly be considered “self-interest” (egoism) in the most fundamental sense of the term. You seem to think that egoism means that morality is determined by the subject’s whims, but that isn’t the case. Morality is determined by the nature of objective reality — *including the objective reality of the subject, and his need to align himself with objective reality*.